I am a huge fan of LeapFrog learning DVDs and have used them to reinforce basic reading skills with my first son in past years and now with our 3yr old twins. 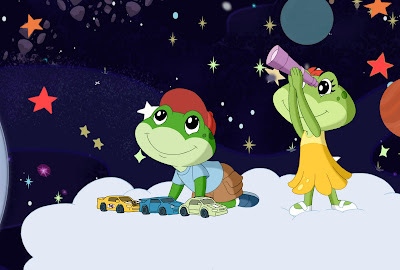 That is why I jumped at the chance to review the new LeapFrog Math Adventure to the Moon, which was released on February 23rd, 2010. One major difference I noticed about the newer LeapFrog DVDs is that they contain more music and the music is more for entertainment like a music video would be. Although the lyrics explain a concept, it is not the repetitive rhyming like the songs in the original DVDs. In the past, the LeapFrog songs were meant to help the child learn and remember what was being taught. My children enjoy both equally, so I would rather have the songs that reinforce the lessons. My 3yr olds are just starting to learn number recognition and counting. Our 6yr old has recently mastered counting by 5s and 10s, as well as basic addition. This DVD also teaches young children that math is truly everywhere. It illustrates this by pointing out that we use math to measure time, speed, liquid volume, temperature, and distance. The main bonus feature on this DVD is the "Sorting Game". It is mainly geared towards 3 or 4 year olds and focuses on matching colors and shapes in order to sort shapes into the correct piles. Other extras are sing-a-longs that are just the musical segments from the movie. This new math DVD successfully lives up to my expectations of a LeapFrog learning DVD. It packs a lot of learning into 36 minutes. My children never get tired of watch the other LeapFrog DVDs repeatedly and I think they feel the same about this one. You can purchase this DVD on LionsgateShop.com and most places where LeapFrog DVDs are sold. Thank you to Lionsgate for sending us a sample DVD free of charge to base this review upon.